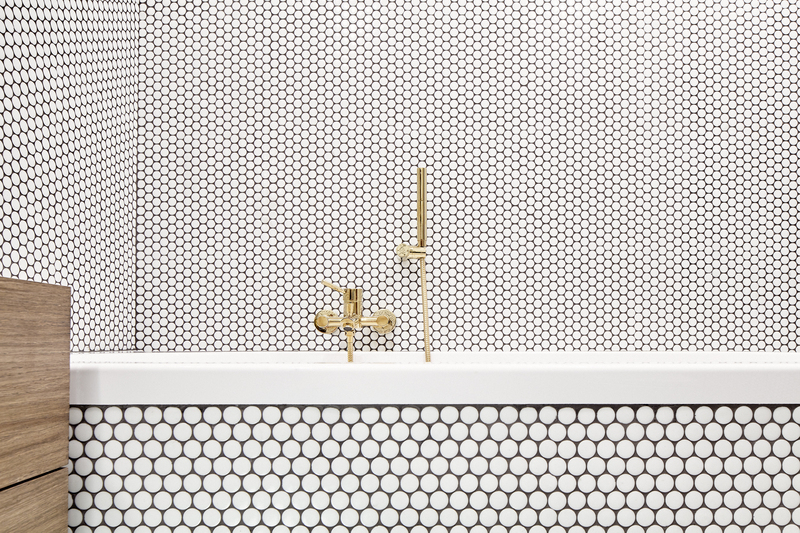 White mosaic tiles from Hisbalit keep a mostly-white bathroom in a renovated Prague apartment from feeling boring—metallic accents don't hurt either. Rugs always add a tactile layer. In the living room of this updated Venice Beach, bungalow, one also offers a pop of color in the form of an ultra-blue shag from the Shag Rug Company. In this rustic San Francisco kitchen, the worn texture of the reclaimed cypress cabinets mirrors the Carrara marble countertop's rich veins. A mural made of felt panels adds interest—and an audio buffer—to this Boston nursery. A red steel pegboard backsplash provides easily access cooking utensils in this Boston kitchen. The cabinets are IKEA. Photo by BoysPlayNice Photography & Concept. Image courtesy of © Jakub Skokan, Martin Tůma / BoysPlayNice.